Wakeboarding is a great boarding sport. Many have even dazzled by this sport - spectators and players alike. Many hotspots and specialized locations around the world ahve sprung up which cater not only to wakeboarding and wakeboarders but also other sports, offering vacation packages as well. Below is a list of top-quality locations ideal for wakeboarding and other sports. AquaSki Adventures in Costa Rica - A ski paradise. However, their vacation consists of much more than just year round world-class water-skiing (behind a Ski Nautique Boat). It hosts quite a few people who are first time skiers and boarders (slalom and wakeboarders) and just as many who don't even ski at all! You can combine skiing, wakeboarding, barefooting, hiking, biking, rafting, language learning, taste testing, horseback riding, ATV riding, river floating and other tourist activities. Cancun Water-ski and Wakeboard - Offering water-ski and wakeboard instruction for all levels from beginner to pro. Slalom course and package deals available. Bush's Sports Centre - Water-skiing, wakeboarding courses and clinics, equipment sales and rentals in Bala, Ontario, Canada. Seattle Watersports - The largest wakeboard and water-ski pros hop in the Pacific Northwest. Willi's Water Ski Center - Lessons from beginner to professional in slalom, jump, trick, barefoot and wakeboard. Near Napa Valley. Lake Berryessa, CA. Mission Bay Aquatic Center - Water-skiing, wakeboarding, other water sports. Courses and equipment rentals. San Diego, CA. California Delta Waterway - Good water skiing, wakeboarding, fishing, and camping spots in this 1,000 mile waterway. Marina and launch ramp listings. Canyon Lakes - A community with water-ski and wakeboard clubs and events. Canyon Lake, CA. California Skier - Salom and wakeboard instruction for all skill levels. Pro shop, boat sales. Lake Elsinore, CA. Bay Area Water Ski Club - The Bay Area Water Ski, wakeboarding and foilboarding club is a nonprofit, non-competitive, recreational based club. The club features fun water sport events throughout the year including weekend camping, single day water skiing, houseboat trips, and instructional how-to events. Pickos Ski and Wakeboards School - The Pickos Ski and Wakeboard School is the world leader in water ski/wakeboard vacations and instruction. 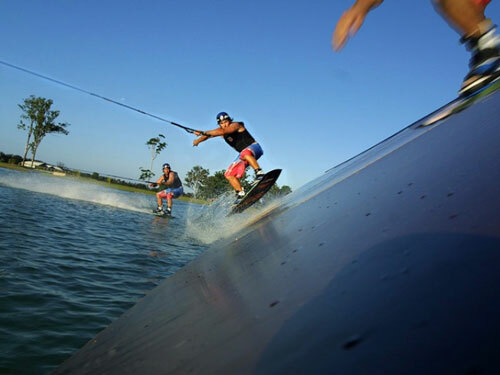 They specialize in water-skiing and wakeboarding, and their main goal is to provide you with the very best in instruction and to give you a world-class water-ski/wakeboard experience. O'Town Watersports - They coach all levels of water-skiing and wakeboarding from beginners to World Champions Dallas Friday, Leslie Kent, Rusty Malinoski and Danny Thollander. O'Town has multiple sliders and a kicker, along with 3 slalom courses to challenge all levels of wakeboarders or water-skiers. They believe in one-on-one coaching tailored specifically to each individual’s needs with coaching/training programs that are extremely in-depth using both trampoline and weight training. Clients travel from all over the world to train with Their top riders/coaches for weeks on end. O’Town Watersports has a prime downtown Orlando location 10 minutes from the Orlando International Airport and 25 minutes from the Convention Center, Universal Studios and Disney. Sheffield Cable - Wakeboard, slalom, trick and jump at North England's only cable water-ski site. Aqua Ski Cable Tow Water Skiing and Wakeboarding - Cable tow water skiing facility in Skegness, Lincolnshire. Cable tow design, manufacture and servicing worldwide. Portugal International Waterski and Wakeboard Center - Located on a private lake, 1 hour east of Lisbon. Includes on-site club house, swimming pool, toilette, shower, and Correct Craft boat. Offers instruction with 3 slalom courses, 1 jump, and personalized coaching for the beginning to expert level. Taxi des Mers - Skiing, wakeboarding for 3 to 77 year-olds on the French Riviera. Nice, France. Ski West - Instruction in slalom, trick, jump skiing, wakeboarding, at all levels. Garennes sur Eure, France. Alphavillage - The eco resort Alphavillage has a lake with an extension of 2,100 feet, covering an area of 13,6 acres, perfect for water sports, such as slalom, jump, tricks and wakeboard. The eco resort has 2 Ski Nautique boats with PCM 320 HP Multiport engines, both equipped with Perfect Pass 6.0, and provides all the necessary gear. Regularly hosts international competitions. There are more and more wakeboarding centers opening around the world Find one near you and start to enjoy the great sport of wakeboarding.